So this blog is primarily the things that Jonathan and I do together, or fun trips that we take individually. But today I have to hijack its purpose to remember a dear friend. He would have been 27 years old today. I met Adam "ACE" Emling back in high school at LPA. He was in band. He took French. 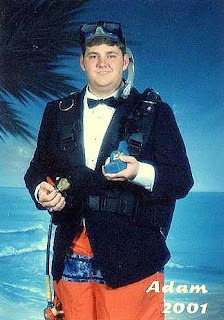 He loved the ocean and fishing and scuba diving. He was full of school spirit. He was hilarious. He was friendly. He gave great hugs. He had no enemies. Adam was a year older than me, so he headed off to college when I was a senior in high school. I heard all about his freshman year at FSU when he came back for winter break. He had a great time at football games, and had joined the A Phi O service fraternity. It wasn't until my third year at Florida State that I hung out with Adam on a semi-regular basis. He loved to bowl, and a group of us went several times. He loved the campus, and we did many of the free things in the student union. I especially remember a time at Breakfast for a Buck. The night before Graduation Weekend (Adam and I both graduated Spring 2006), I had dinner with him. We went to Gordos, a cuban place, and we each had pressed sandwiches (I can't remember what kind anymore, but I remember that they only differed by a single ingredient or something). We talked about upcoming plans. I was staying in Tallahassee for graduate school, and Adam was leaving the area. He was among many friends I knew who were thinking of joining the Peace Corps. As we walked to our respective cars, we hugged goodbye and wished each other the best. I still can't believe that night was the last time I'd ever see him. Adam moved to Rochester, NY before long. Although he was a history major, he found a job at a liquor store, and liked it okay. A little over a year after I last saw him, on July 14th, 2007, Adam was killed. Adam was an innocent bystander at a restaurant, and was just caught in the line of fire when a patron tried to shoot a bouncer. Adam was shot in the stomach, and died within a few hours. He was 24 years old. The man who shot him is serving 25 years to life for second degree murder, and 15 years to life for second degree attempted murder. Since he was 41 years old at the time of the crime and the sentences are being served consecutively, he may never see freedom again. Still, of all the people who could have been accidentally injured that night, why Adam? I know this is a common thought that people have when someone special dies. And that it always seems like the very best people out there are the ones who end up losing their lives too soon. But Adam certainly fits that description... and may he forever be remembered as a great person by all who knew him. There have been many events since Adam's death where his friends and family have gotten together, including a bowling event this evening in St. Lucie West. In Tallahassee, a wall was painted in his honor, a pledge class for his fraternity named for him, and a brick has been placed at the Westcott fountain. 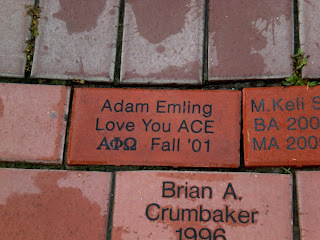 I was among the many who contributed to the brick, and last time I was in Tallahassee, I finally located and photographed it. if you want to find it at the fountain, let me know - I can explain where it is.